I think my roommate is in love with me. Let me back up, it was momentary love. And it might have just been the fact that he was actually in love with the smell of Frank’s Red Hot wafting out of the kitchen and into the hallway. I totally respect a Frank’s Red Hot love. You see, a few weeks ago I tried to make Buffalo Chicken Meatballs, but failed miserably when I used cayenne instead of hot sauce. Yeah, you can’t just substitute hot sauce out, it’s integral. Anyway, I thought I’d give it another go. This time going right for the jugular. I caved and went to the store to buy Frank’s (my favorite hot sauce and go to condiment). What happened after is a secret between me and you, my blogger buddies. You see, I needed someone there to stop me. Someone to say, “no, don’t eat that.” Because they didn’t make it through the night. I actually ate the entire batch in one sitting (with the exception of one my roommate ate). Sickening, I know. But I’ll be honest, they were delicious. Heat a skillet on medium heat. While that is getting warm, mix chicken, hot sauce, couscous, and cheddar cheese together in a bowl until everything is evenly mixed together. Spray pan with cooking spray. Roll meat mixture into one-inch balls. 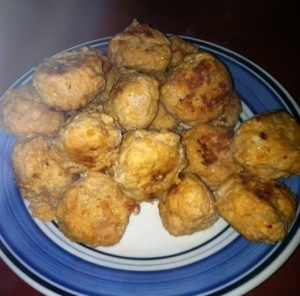 Place balls in pan and cook through. That’s about 4 minutes a side, rotating them until the outsides are brown and the insides are cooked. Be aware, though, if you over stuff your pan, your chicken won’t brown because there will be too much moisture in the pan.